http://on.hulkcdn.com/static/embed.swfWait, what? Something looks/ sounds familiar here. 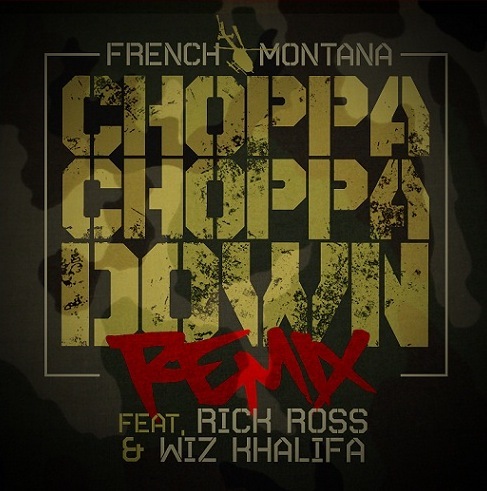 Just over a month ago, the remix to French Montana's "Choppa Choppa Down" was released with Wiz Khalifa and Gucci Mane on the track. Now a month later, and with Gucci now in jail, the "official" version has just been released with Rick Ross replacing Gucci's verse. Same difference? Either way a music video for this remix is currently being shot, so be on the lookout for that.NOTE: The stream of this song is strictly for promotional use. All streams/links are hosted on third party sites. TheMaskedGorilla.com simply acts as an index. Wait, what? Something looks/ sounds familiar here. Just over a month ago, the remix to French Montana’s “Choppa Choppa Down” was released with Wiz Khalifa and Gucci Mane on the track. Now a month later, and with Gucci now in jail, the “official” version has just been released with Rick Ross replacing Gucci’s verse. Same difference? Either way a music video for this remix is currently being shot, so be on the lookout for that. NOTE: The stream of this song is strictly for promotional use. All streams/links are hosted on third party sites. TheMaskedGorilla.com simply acts as an index.